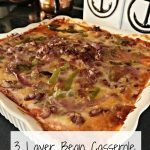 Layered Bean Casserole is a perfect side dish for a Mexican meal. 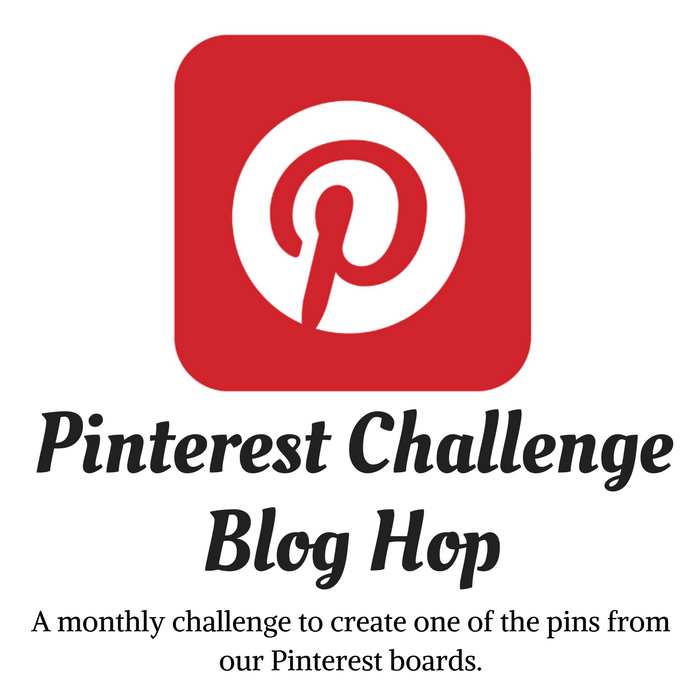 It’s time for the monthly Pinterest Challenge Blog Hop, hosted by My Pinterventures. The purpose of this challenge is to motivate the participants (and you, too) to not just pin, but to make it happen! We all have tons of pins that we think we’re going to try. Every month, we choose one and follow through with the plan to make it. 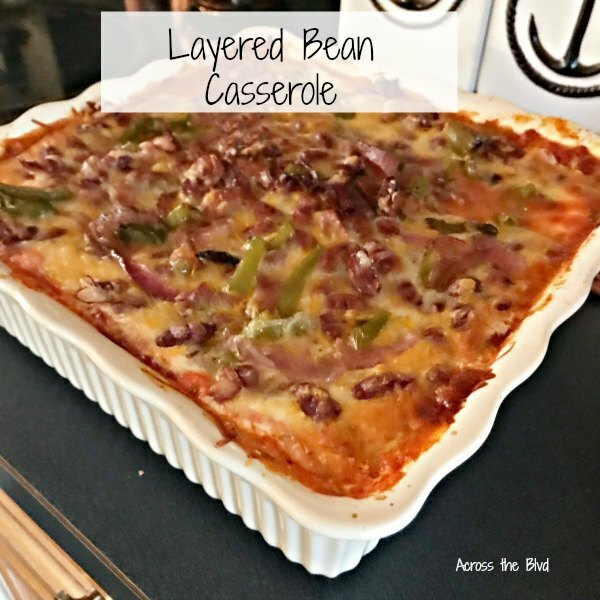 This month, I decided to try out a recipe for a Layered Bean Casserole. I needed a recipe for a meatless, but hearty dish. We had a family gathering and my niece doesn’t eat meat. So, off to Pinterest I went to find a recipe. 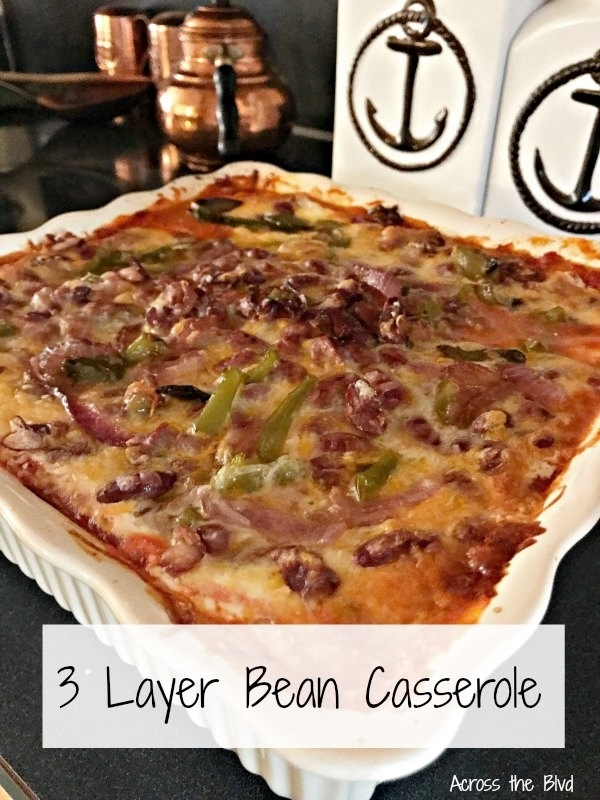 When I saw this pin for a layered three bean casserole, I thought it would be a good dish to serve. It’s a recipe that was posted on Delish back in 2010. I did change the recipe to better suit our tastes. We aren’t big fans of hot spicy foods, so I substituted bell peppers for the poblano peppers called for in the recipe. I sautéed them with the onions instead of adding the onions on top of the casserole. I also used a tomato salsa instead of the salsa verde. So, yeah, I ventured away from the inspiration, but I know what my family likes and spicy peppers and salsa verde are not on the favorites list. One of the things I’ve enjoyed about participating in the monthly Pinterest Blog Hop is being inspired to put my own spin on the crafts and recipes that I’ve pinned. This will make a full 9 x 9″ dish. I worried that it might spill over in the oven, but it didn’t. Yay for no mess! Slice peppers and onions and sauté in olive oil until tender. Combine sour cream and milk until well blended. Spray a 9-inch by 9-inch baking dish with non stick cooking spray. Arrange 3 tortillas in single layer in baking dish. You’ll need to tear the third one in half to fit the pan. Bake for 45-55 minutes until bubbly. 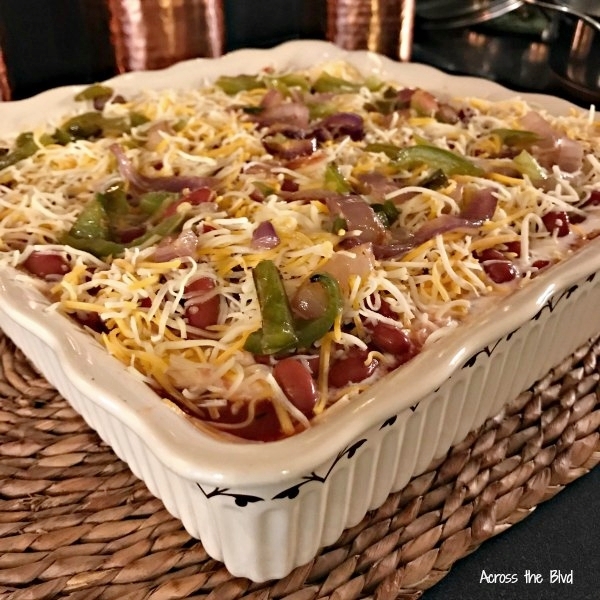 I served this as a side dish with my Easy Prep Taco Salad for a recent small family gathering. They all loved it, so this will go on my make again list. It’s not the prettiest dish, but it is a tasty one! Some of my guests thought this would make a great dip for Tortilla Chips, too. I think it might be great for a game day party served with chips. Now let’s see what other things Pinterest inspired! Head over and visit the other hosts to see what they crafted, cooked, built, or tried! My husband would love this. Recipes are great as a base, but we all know our families taste buds. I agree. I often change them up to suit our tastes. That’s part of the fun of this challenge! We aren’t ones for spicy foods either and I often find myself modifying recipes like this. Sure looks yummy! Pinned. Thanks, Joanne! I hoped your family will enjoy it! Thanks so much for pinning. Casseroles are so great to prepare in advance and i make them often. 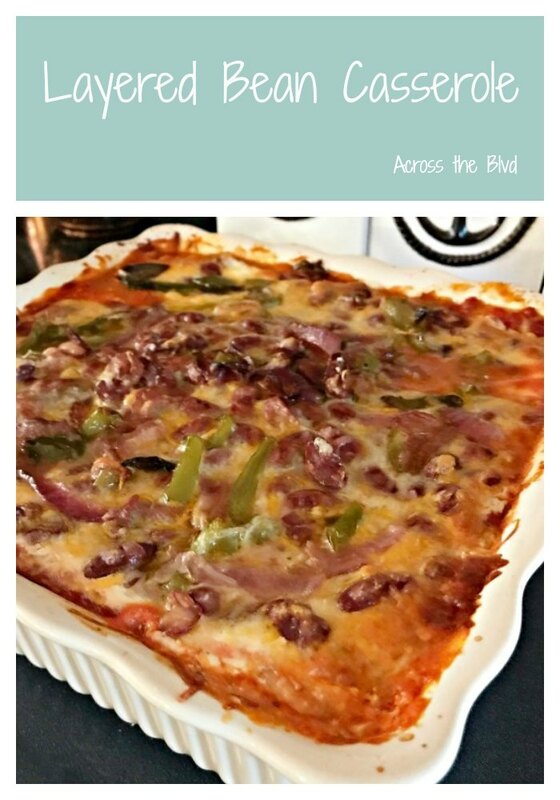 Love this recipe, it looks delicious! I love casseroles, too. Thanks, Katrin. Thank you, Toni! I don’t cook it often at home either. I was happy to have found this recipe and was glad that I could adjust it and have it still turn out well. My niece is a sweetheart, so I was happy to find a good dish to serve her. I’m with you on too spicy! When I try it, I think I may substitute red bell peppers or mix them with the green. Any peppers would work- it all depends on what flavor you’re going for. I hope you’ll enjoy it! This recipe sounds so delicious. The thing i love about this challenge is we get the basics and gear them to our tastes. I bet this recipe was a hit. I love that about the challenges, too. It’s always fun to change things up and have them still be tasty. Thanks, Debra! Everyone loved it. Had to pin your recipe. Looks wonderful and I appreciate the less spicy version. I know my family will enjoy this too. Thanks for sharing! Thanks for pinning! Gloria loves spicy foods, but the rest of us aren’t big fans of it. Adjusting the recipe worked well. Thanks, Laurie! What a great combination of flavors! Looks delicious! Thanks, Roseann! It was tasty! This would be great to fix for my sister when she comes to visit! She doesn’t eat meat either and loves Mexican food, too! I always have a terrible time fixing meals for her. She usually ends up making her own. This looks so tasty! Pinned!!! It’s a very hearty dish and could easily be served as a meal instead of a side dis. Thanks for pinning, Gail! I would have gone for the poblanos, but bell peppers make a great substitution. the whole casserole looks very hearty. That’s what’s fun about this challenge. We find something we like and change it up with our own spin. This recipe can be adjusted to suit anyone’s taste. Oh this looKs so good! Anything loaded with cheese is a favorite in my family! I agree-cheese is always a plus! Thanks, Michelle! What a scrummy dish!! Will be adding this to our Mexican night and I’m sure it will be a huge hit too!! Thank you so much for sharing! Thanks, Sam! My family loved it. I hope yours does, too! This does sound like a hearty meatless dish. I like your substitutions since I don’t like super spicy either. Pinned. It was tasty! Making the substitutions turned out great. The challenge is always a fun to participate in. Thanks for organizing it, Erlene. Recipe? Who needs a recipe!? ha ha. I’m so that way. It’s just a suggestion and then I kind of do what I want. That’s super sweet of you to come up with such a yummy dish for your niece. I’m sure the whole family was able to enjoy it. I agree! Recipes are just guidelines! I was pleased that I found a recipe that could be adjusted easily. Thank you, Bri! Your casserole looks really delicious! I’m always looking for new recipes to try. Thanks! It was tasty and my family enjoyed it. Sounds good! I would totally eat this with chips! thanks for sharing with #thursdayfavoritethings! Thanks, Angelina! I think if the tortillas were left out it would make a great dip for chips. Thanks for the party. Beverly, this recipe looks so good! I’ve made it a feature at the Whimsical Wednesdays Link Party. Thanks for linking up with us! Thanks so much, Michele! I appreciate the feature. I just stopped by the party to link up this week. This looks so delicious! Thanks for sharing at the What’s for Dinner party!! Thanks, Helen! It was a hit! Thanks for the party!